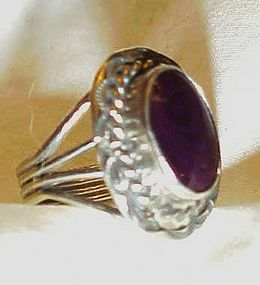 This pretty ring has a center stone that is a pretty amethyst purple clor. set in Silver. 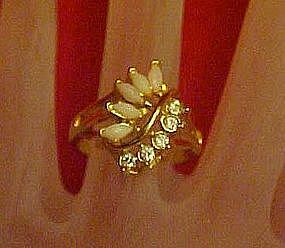 Ring is a size 8 and is in great condition. 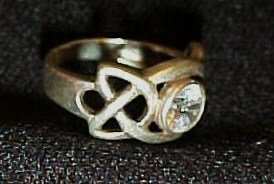 Pretty sterling silver ring marked 9.25 and is made with a Celtic knot style with a sparkling CZ stone. 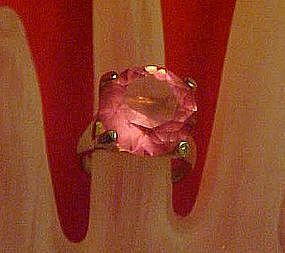 Ring is a size 6. Listing another gorgeous purple amethyst birthstone ring. Marked 925 and has a total weight of .22 ounces. 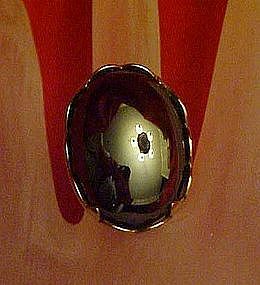 Large oval faceted amethyst stone. (Registers #3 on my diamond tester), so is not just rhinestone. Size 9. A deep purple, and stone is scratch free. a gorgeous ring! 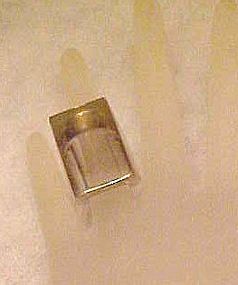 Prety ring marked 925 and the # 10. 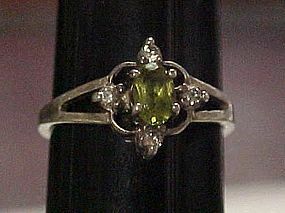 Pretty emerald cut peridot color rhinestone with 4 smaller clear rhinestone accents. Great condition. 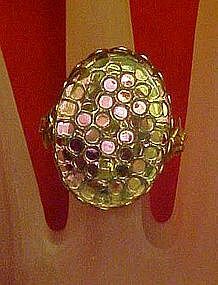 Nice costume ring has 5 different color prong set stones. 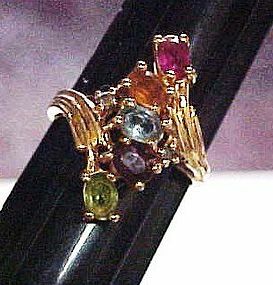 Rhinestones include peridot, amethyst, blue topaz, yellow topaz and a ruby. Nice heavy gold tone plated setting in a size 10. Marked NV and the number 10. Wonderful condition. 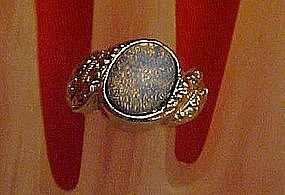 A very pretty ring marked 925 NV and also marked 10 with another oval mark next to it. It appears there are words inside the oval but I can't make it out. The #10 is for the ring size I'm sure. 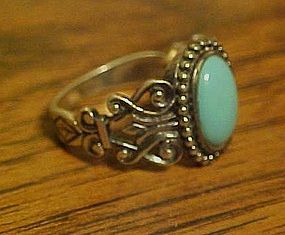 Pretty dark turquoise stone and pretty scrollwork all along the sides of the sterling silver ring. Excellent condition. The ring weighs 5.7 grams. This beautiful ring will just knock your socks off. No markings of any kind, so not sure if it is electro plated, chrome, rhodium or what. 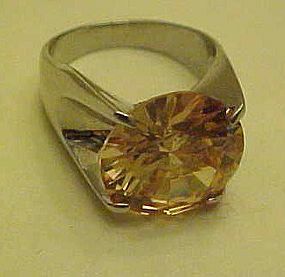 The stone is stuning and is finely faceted to catch and reflect prismatic colors from light. Stone measures 5/8" in diameter and is prong set. Ring is a size 10 and is flawless. I just don't know a thing about it, except it is magnificent!! Very cool, smoky lavender color lucite ring with large chunky rectangular shape. size 5. Pristine condition!! 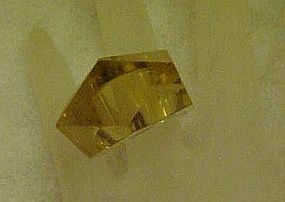 Very cool, light amber color lucite ring with large faceted shape. size 5 1/2. Pristine condition!! 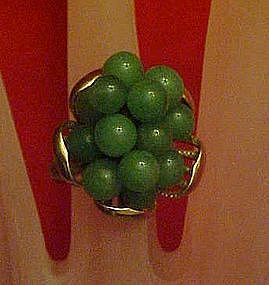 Vintage costume ring is a cluster of real jade beads piled in a antiqued gold tone flower petal setting. Squeezable adjustable band on the ring. Nice condition. No name. 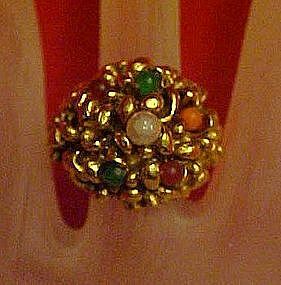 This is a very pretty ring the large 1/2" x 1" faux opal stone is prong set in a gold tone setting.Rainbow colors sparkle at the slightest movement. Squeezable adjustable band. Excellent condition, shiny and no flaking or wear. 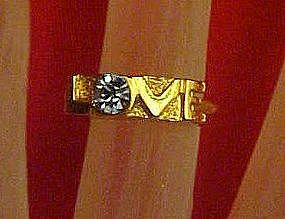 Cute LOVE ring, gold tone costume with aqua rhinestone to simulate a blue Topaz for the December birthstone. I have 2, price is for each. Like new condition. Size 3 1/2. Perfect for a pinky ring, or that special little girl. 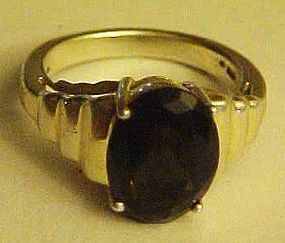 This vintage ring looks very impressive with the large 1/2" x 1" black mirrored cabochon. Set in a silvertone filigree backed setting. Surprise!! Its just an adjustable costume ring. 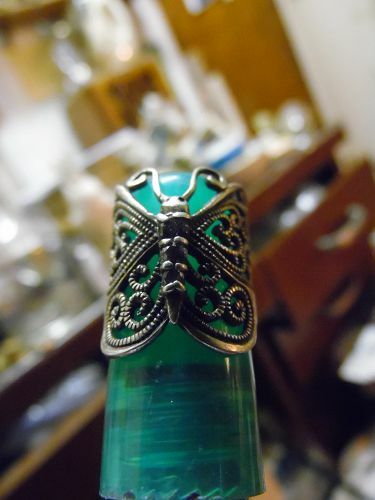 Beautiful vintage accessory for this low price. Excellent condition!